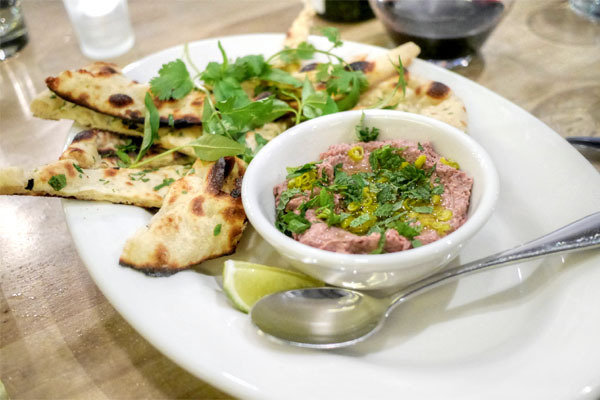 One of the biggest Santa Monica debuts of 2015 has got to be Cassia, a modern Southeast Asian eatery from Bryant Ng/Kim Luu-Ng and Josh Loeb/Zoe Nathan. If you recall, Ng opened The Spice Table back in March 2011. 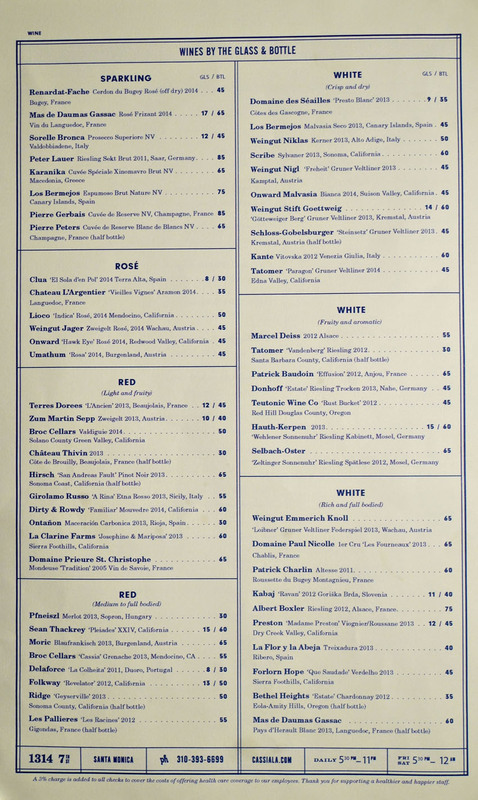 He made quite a name for himself there, even securing Food & Wine's "Best New Chef" award in April 2012. However, by the end of that year, it was almost certain that the place would have to shutter in order to make way for Metro's Regional Connector. 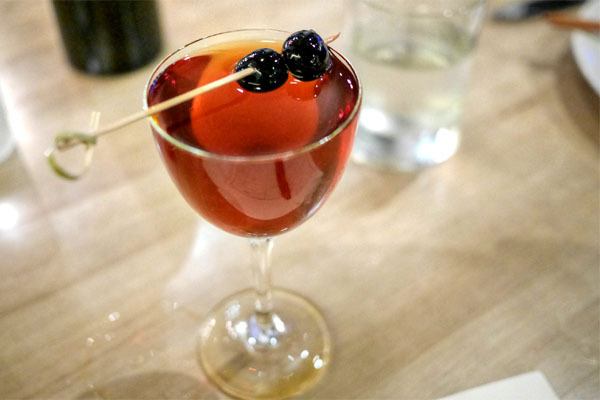 The restaurant ended up closing at the end of 2013, but the Ngs had already partnered up with the Rustic Canyon/Huckleberry/Milo & Olive/Sweet Rose duo that October. 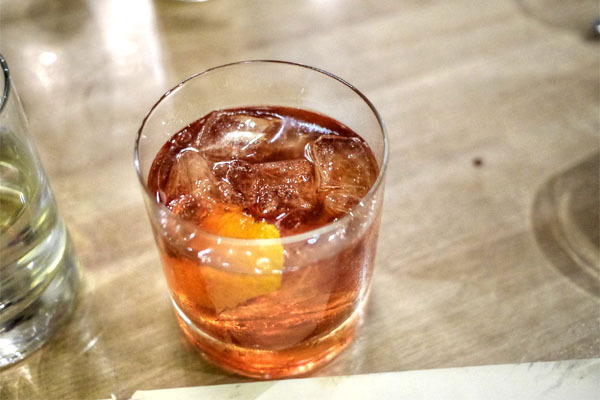 With the deal in place, work on Cassia began in earnest, but construction delays pushed the grand opening to June 13th this year. Ng has brought on a familiar cast to join him, including Chef Consultant Joseph Marcos (Ugly Drum Catering, Olive & Thyme, Mendocino Farms, Pizzeria Mozza), Chef de Cuisine Matt Armistead (Gjusta, Soho House), and Sous Chef John Stenbakken (Pizzeria Mozza San Diego). 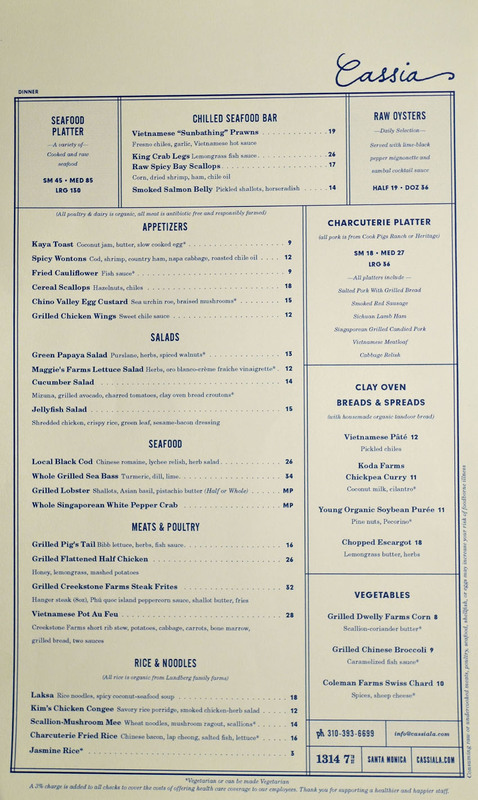 Meanwhile, the FOH is led by Leah Haimowitz (The Spice Table, Mendocino Farms, Mozza) and hospitality veteran Ralph Waxman (The Spice Table, Mozza, Opus, Dakota, Whist at the Viceroy, Mako, Jimmy's, George's at the Cove). 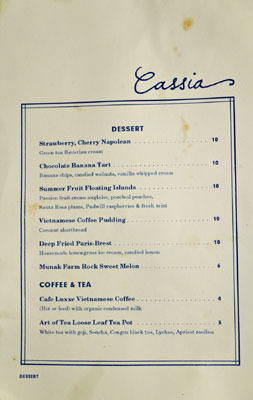 Cassia occupies the ground floor of a 1937 Maurice Sasso-designed Art Deco building that previously housed switchboard operations for Verizon. 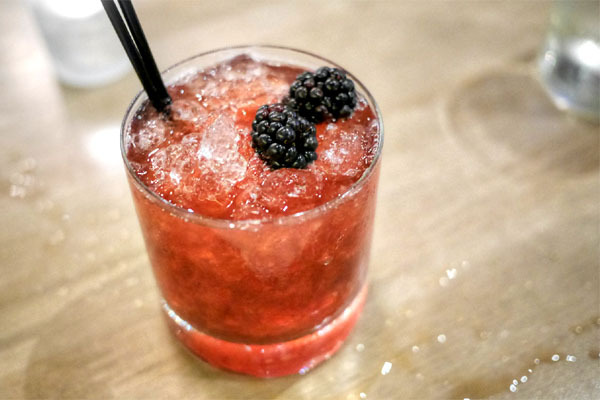 The 5,000-plus square-foot space was redone by Montalba Architects, the local firm responsible for Huckleberry, Milo, Sweet Rose, as well as Nobu Malibu. The high-ceilinged main dining area seats about 140 in a varied setup. 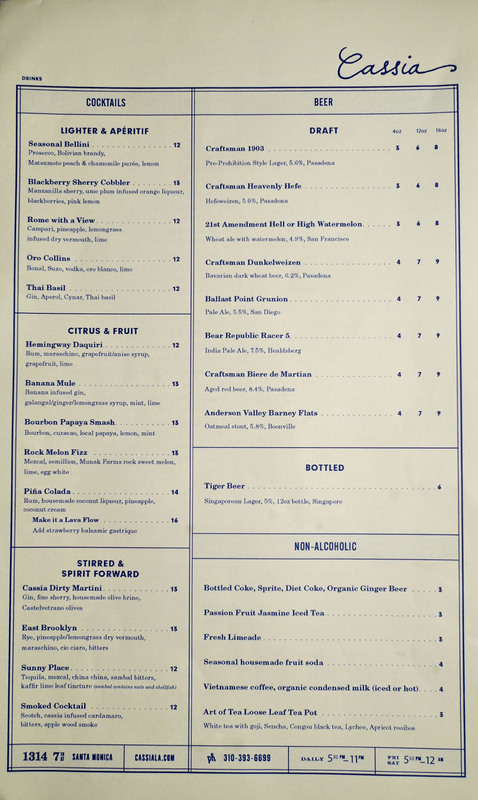 You'll find the bar and the raw bar in the front, surrounding an open, bistro-like area, while there's a more sedate "wine room" further in the back, alongside "Baby Spice," a portion of the restaurant housing the old Spice Table bird cages, the old wood grill, and a chef's counter. There's room for an additional 60 on the patio, while the private dining room handles 20 more. It is important to note that Cassia's large, multifaceted menu isn't just a reworking of what Ng was putting out over at The Spice Table. There are a few O.G. 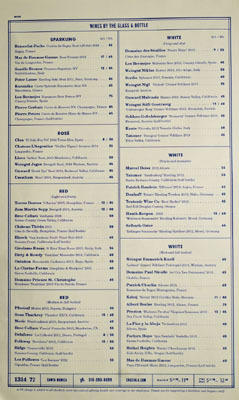 items to be sure, but for the most part, the idea here is to blend the Chef's Singaporean-slash-Vietnamese stylings with a French brasserie bent. 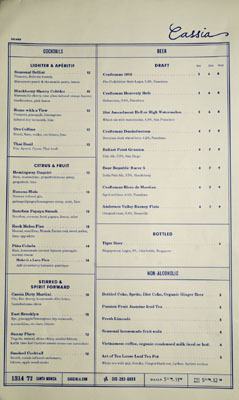 Drink-wise, you get a handful of beers from eight taps, a reasonably-priced, international wine list compiled by Kathryn Coker, as well as appealing-sounding, market-driven cocktails from barman Kenneth Arbuckle (Bestia, La Descarga, The Doheny). Click for larger versions. We got off to a lighter start with the cocktails, this sherry-based specimen bringing forth a bitter, astringent flavor profile intertwined with fruit, the back end imbued with a distinct medicinal tinge. 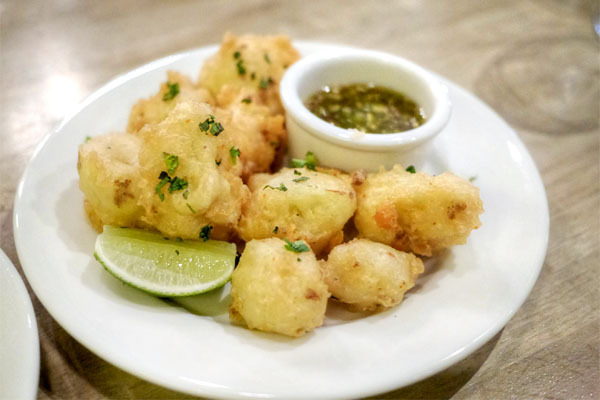 Our first dish is quickly becoming one of the favorites at Cassia. Prawns came out chilled and lightly cooked, their ocean-y flavors complemented but not overwhelmed by the earthy spice present. 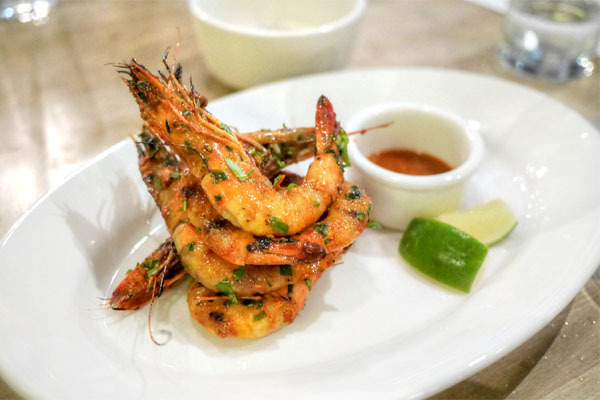 Like peel-and-eat shrimp, but thankfully without all the work. The escargot was a standout, arriving as garlicky and as herby as you'd want, and even better with a squirt of citrus. 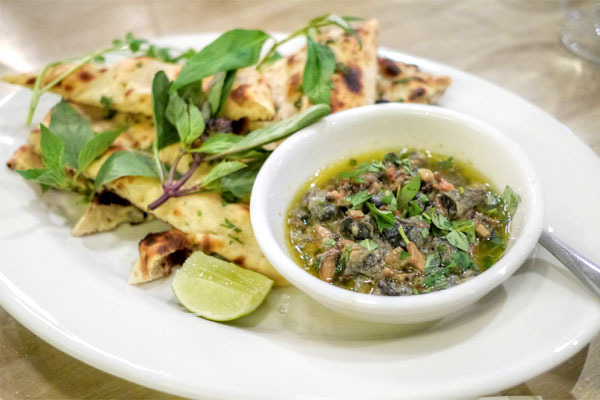 I'd never seen snails used as a spread before, but they worked beautifully here with the buttery, blistered shards of naan (made in-house on a tandoor). 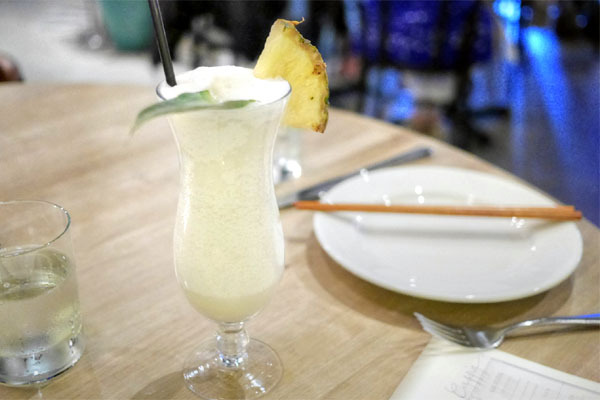 The piña colada was a legit example, with its soft, smooth, just-sweet-enough coconut notes accented just a smidge by the tartness of pineapple, the rum barely peeking through it all. 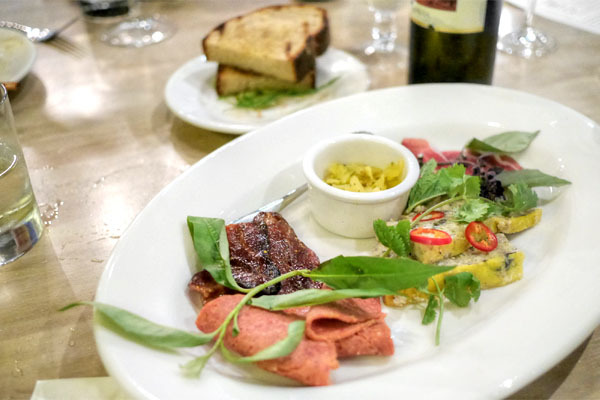 Salted Pork With Grilled Bread: This almost lardo-like preparation showed off a boatload of porkiness and salt, yet was tempered by the application of scallion--a fitting accoutrement to the thick cuts of toast. Sichuan Lamb Ham: Hammy, but with a delightful, almost botanical spice to it. Vietnamese Meatloaf: Soft, almost creamy in consistency, with a savory, herby quality and lingering heat. Smoked Red Sausage: Gritty in body, with a straightforward savoriness. Singaporean Grilled Candied Pork: Chewy little bites loaded with sugar, smoke, and spice. Some of my dining companions described this as "Korean-ish" (think gyeran jjim), and indeed, it conveyed a lovely depth and sesame oil-esque savor. I loved the earthiness of the mushrooms here, as well as the moderating effect of green onion, and though the urchin added further luxuriousness and brine, it wasn't strictly necessary for me. A very cozy sort of dish. Next was another standout cocktail, this one deftly blending boozy and dark fruit at its core, with contrasting bitter and smoky notes coming through later. Superbly well balanced and integrated. I don't usually do salads, but couldn't resist one with jellyfish in it. 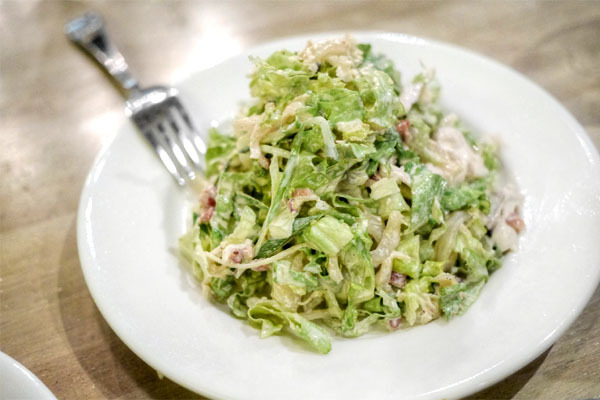 The star ingredient worked as a textural element here, adding a gorgeous crunch to a perfectly good, nutty chicken salad. 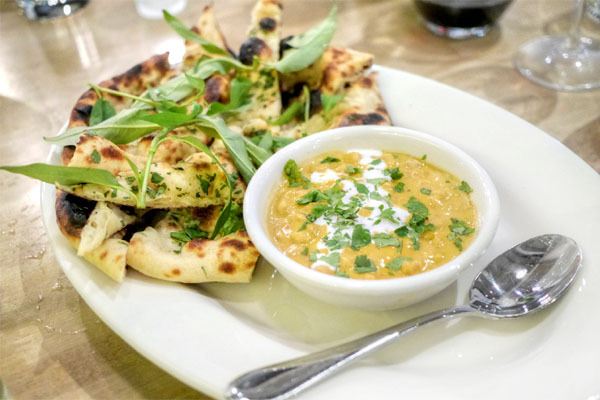 This dish was a favorite of mine back at Spice Table. It didn't quite hit such lofty heights tonight, but was still a strong effort, a balance of crisp and supple textures with the fish sauce once again imparting that beautiful funk, spice, and zip to the mix. 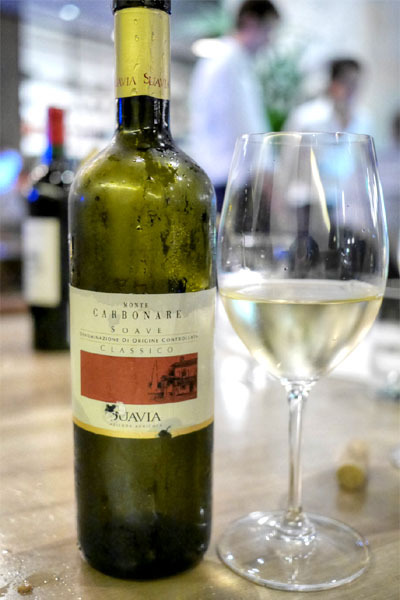 One of my dining companions brought a couple of food-appropriate wines with him, the first of which was the 2011 Suavia Soave Classico Monte Carbonare, made from the Garganega grape. I really enjoyed this one: complex on the nose, with a deep, almost funky quality, while on the palate, I got soft, round, grassy nuances and a touch of tropical fruit, all backed by a great touch of minerality. 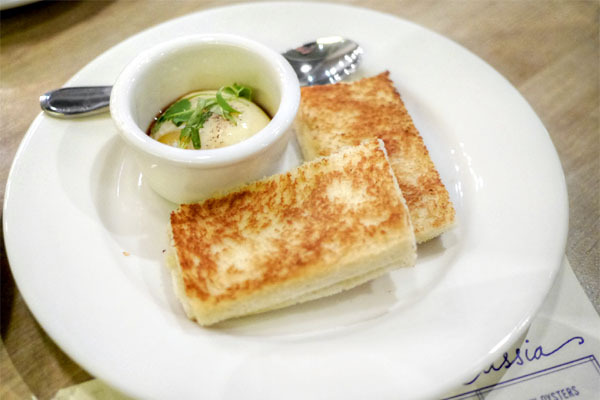 The kaya toast was another holdover from the Spice Table days, and didn't disappoint. I was a big fan of the sweet, coconut-infused flavors of the toast, as well as how that all played with the salty savor of that runny egg. Wontons were rather tasty: umami-rich at first, but with a fantastic hit of numbing spice on the close. Comforting overall, though I wanted a bit more firmness on the actual skins. 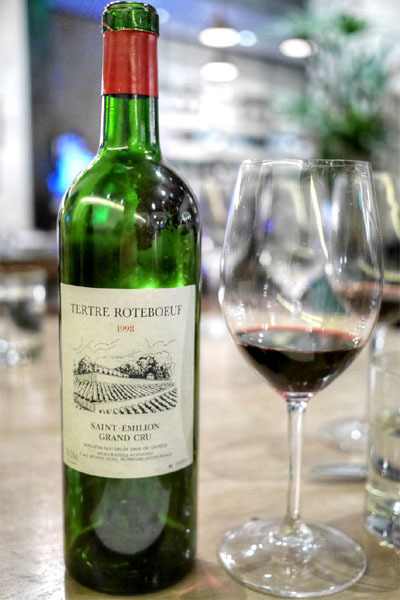 Red wine duties were handled by the 1998 Tertre Rôteboeuf, an unclassified Grand Cru Bordeaux hailing from St. Émilion. I found it classic in essence: peppery and smoky to the smell, with lots of berry; the taste, meanwhile, went tannic, mineral-y, and earthy, with more of that dark fruit showing up. 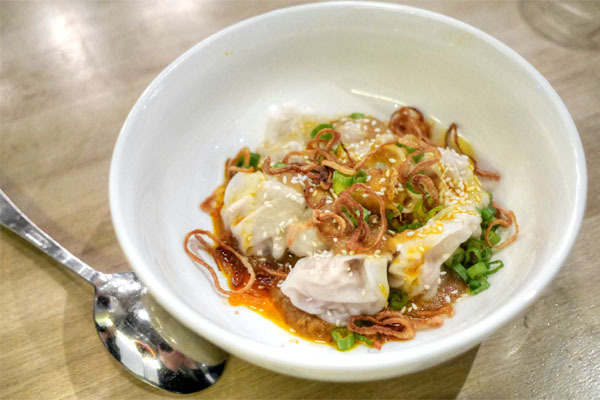 Ng's take on gan xay didn't shy away from the liveriness one would expect from the dish. Its earthy flavors were on proud display here, tempered just a bit by the application of mint while the chilies added a hit of piquancy to the fold. 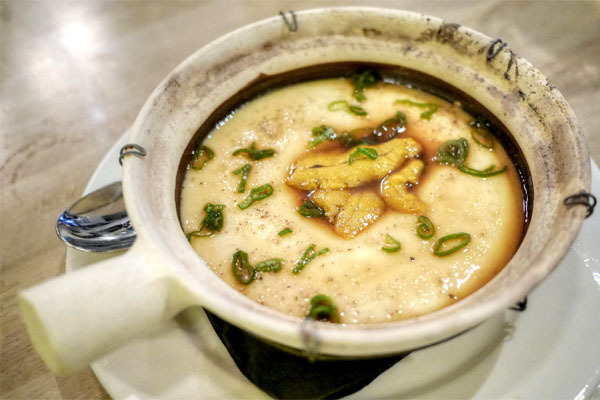 The cháo gà-inspired congee was another standout for me. I loved the depth of flavor here, along with its accompanying smoky, herby elements, the whole thing perked up by a distinct vinegar-y character. 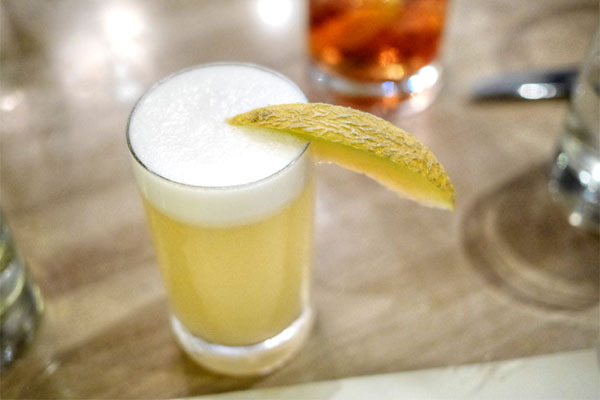 Getting back to cocktails, this next one was to my liking, eggy and frothy at first, with the smoke of the mezcal coming in later, the whole thing finishing with the juicy, aromatic sweetness of melon. A curry of garbanzo was fragrant and sweet, with the coconut milk really making itself known. 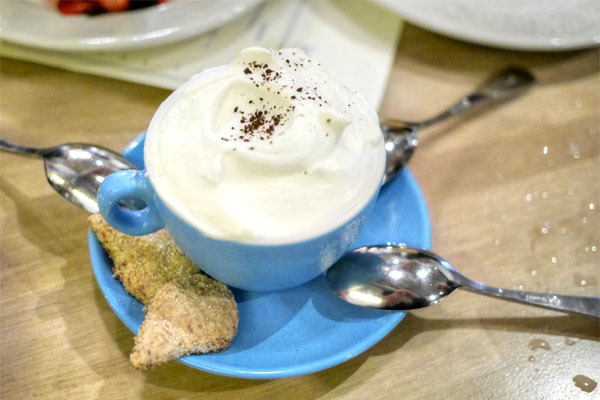 Delicious and comforting all at the same time. Chard saw its bitterness robustly conveyed in this dish, blended with a bevy of spices while the cheese added a weightiness to it all. 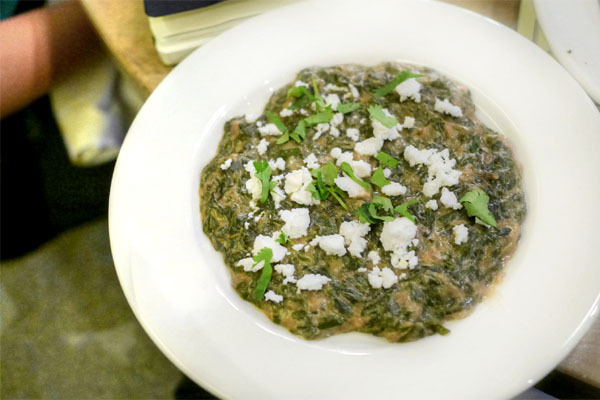 Interestingly, I found it somewhat reminiscent of the Indian staple saag paneer. Our final cocktail was a winner as well: boozy and citrus-y, with a wonderful touch of sweet spice and a finish imbued with a subtle smoke. 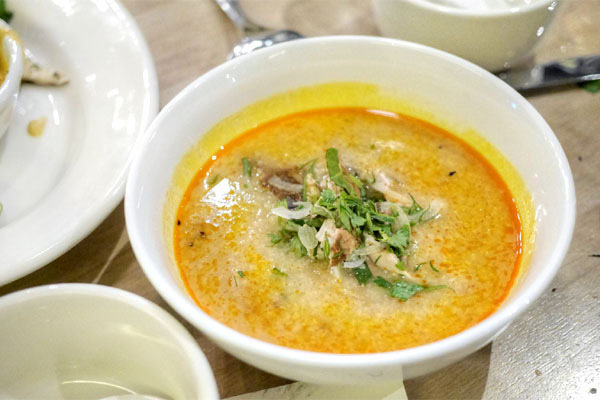 Rice noodles were slippery and satisfying to the bite, with the addition of fish cake adding even more textural play to the soup. I enjoyed the broth here as well, which was simultaneously sweet, spicy, and teeming with a palpable brine. We ended, fittingly, with Cassia's version of pot-au-feu. 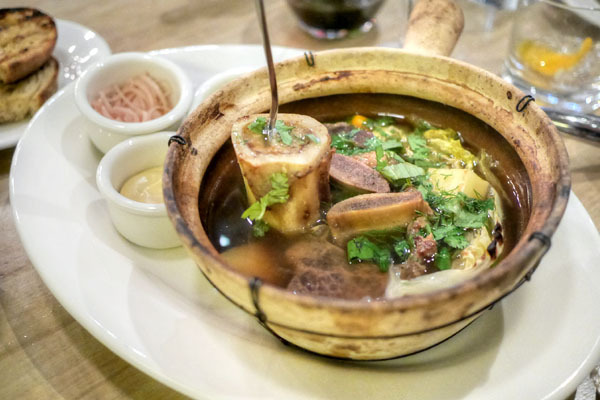 The short rib was the hero here, arriving near falling-apart tender and loaded with all the bovine flavors that you'd want, the spicy pho-like broth adding additional richness and depth to the dish. Root veggies imparted a lovely heft and hominess, while cabbage gave up a touch of lightness, as did the trio of accoutrements: bird's eye chili sauce, Dijon mustard with walnut oil, and pickled shallot. The bone marrow wasn't even needed. 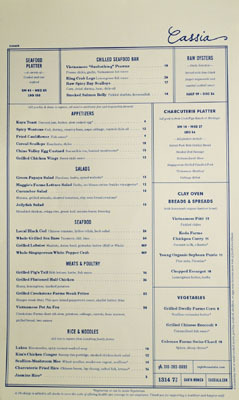 The dessert menu's apropos given the theme here, and is crafted by Zoe Nathan as well as Laurel Almerinda (Rustic Canyon, Huckleberry) and Charlotte Doimo-Mueller. Click for a larger version. I think this was my first time actually having a Paris-Brest, and I was a fan. 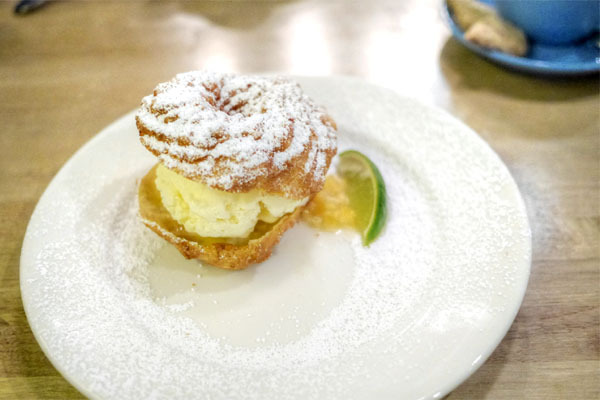 It was profiterole-like in nature, with its tart, creamy filling doing a wonderful job alongside that delightfully flaky choux pastry. The pudding was super coffee forward, really showing off the bittersweet nature of ca phe sua da. Excellent shortbread cookies to boot, which went perfectly with the dessert. 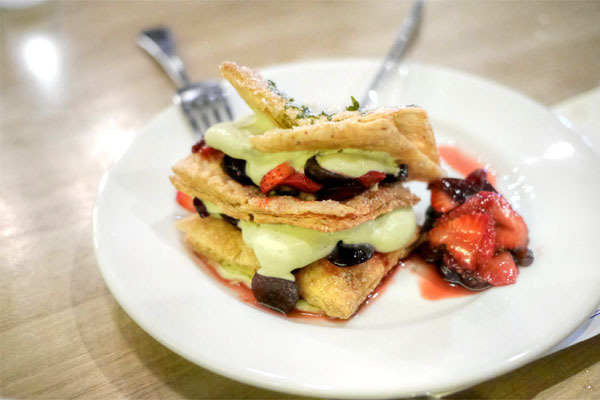 We closed with a spot on rendition of mille-feuille, one with a great balance between the deep, fruity notes present and the contrasting lightness of the cream, all while puff pastry provided a fantastic textural component. 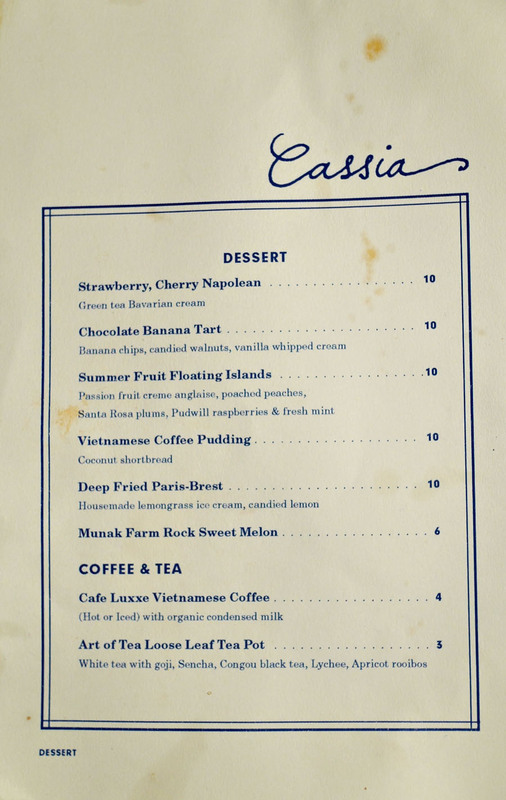 With the Ngs and the Rustic crew on board here, you'd expect Cassia to be good, and it was. 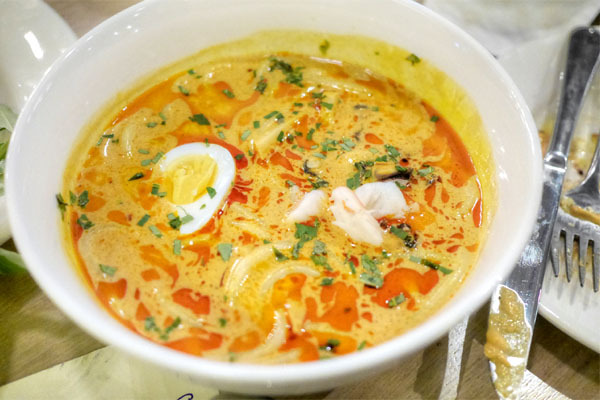 The food presents the core of the Singaporean- and Vietnamese-inspired cooking that the Chef was putting out at Spice Table, but with a decidedly Cal-French slant that looks to be hitting all the right marks. Cocktails, meanwhile, were on point as well, though some felt that the service could use a bit more polish (something that I'm sure they'll work out in due time). Overall, a lovely experience. I really liked Cassia (in a rare case where I got there before you :-)). Very similar thoughts about the 2/3 of the dishes we had in common. Nice bright flavors in that very Vietnamese / Singaporean way. Updated, but without loosing some of an authentic ingredient taste. Enjoyed reading your review especially since I have reservations for Cassia this coming Saturday. Thanks for the sneak preview!